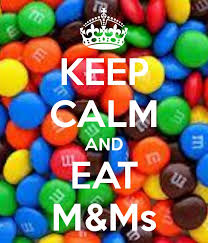 How Do You Eat Your M&Ms®? We decided in an unofficial work poll this week that you can tell a lot about how someone's personality by how he/she eats their M&Ms®. One of my co-workers has an old fashioned gumball machine, and he keeps it stocked with M&Ms®. Several folks had stopped by his office before our meeting, and everyone showed up with handfuls of the coated candy. Here are the results of our "experiment." 1. The majority of people in the room ate their candies in color order. They finished one color before moving on to the next. I'm in this camp. When I was kid, and the dyes were different in the 1970s, I could tell the color by the taste (especially the red ones). 2. Several of the folks always ate two M&Ms® at a time. 3. One person arranged the candies by color in rows, and she ate one from each row to keep the rows even . Her preference was an orderly presentation over the color sorting. 4. One person ate them by the handful. He liked the candy and didn't waste time arranging them. 5. One person arranged them into shapes or pictures before eating. He liked to make art before snacking.